The publishing giant just snatched up a cash cow, erm, bird. Activision has shown multiple big titles this year, including Transformers: Fall of Cybertron, Skylanders: Giants and, of course, Call of Duty: Black Ops 2. but the news sleuths of the Escapist just stumbled upon another, much more secretive reveal nested between some unrelated promotional videos on its gigantic public booth screen. Somewhere between an ad for Call of Duty and some footage of The Amazing Spiderman we caught sight of an eerily familiar, tiny red bird soaring kamikaze-style into the Activision logo's giant "A." Angry Birds? Activision? We quickly cornered the nearest company spokesperson on the thoroughly unexpected avian invasion. "We'll have some news for you in about two weeks," Activision said. 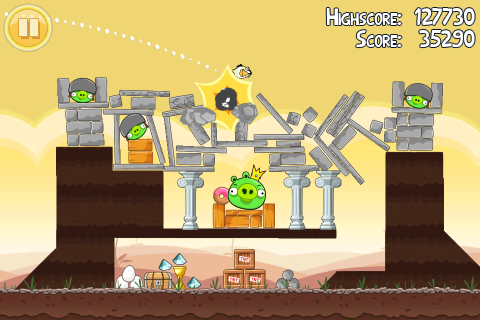 "Wait until you see Angry Birds on consoles in HD." Despite the clever tease inserted into its E3 demo reel, Activision has made no other official announcement regarding the game's imminent migration to core consoles. We'll be reporting on currently unannounced details, such as level-themes, missile-types, and other relevant bird-demolition information when Activision is ready for a full reveal later this month.